I was looking for ways to build Andrew’s hand strength, particularly the muscles that allow the hand to squeeze and squash things. I have shown how I’ve used frosting in a cake decorator (Cookie Cutter Decorating) to work on this and was particularly excited about his interest in making colors with food coloring and thought about combining the two. Knowing that he doesn’t really like to get his hands sticky (neither do I!) 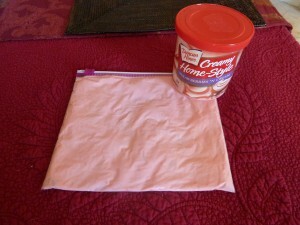 I turned to one of my favorite items for containing messy things – the Ziploc bag. 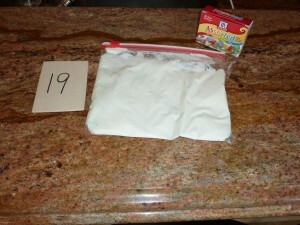 My Obstacle Course Station Activity: Squeeze the frosting to make new colors. I scooped some whipped frosting into the bag and placed some drops of food coloring, strategically scattering them around so they wouldn’t all be clumped in the same spot. For this particular station activity I choose yellow and blue food coloring because it was March and I wanted him to see how those two colors make green. With the prep work done for this (another easy station to set up – time spent, probably less than a minute!) it was ready and waiting for My Obstacle Course to begin. the same way I showed with No “Ick” Finger Painting! Your child can practice making shapes, letters and numbers in the colored frosting while also building finger and hand strength.